In fourth pAsuram – AzhwAr contemplates his own lowly nature and mercifully instructs his heart “Even if you are unable to sustain yourself in separation from emperumAn, you have to hold on to him”. Subsequently, AzhwAr being delighted on seeing that his heart is following his orders, says to his heart “You try to enjoy him incessantly”. Fourth pAsuram – AzhwAr glorifies his heart on seeing it following his orders and worshipping emperumAn, instructs his heart “Even if I leave him citing my lowly nature, you hold on to him”. nenjamE – Oh heart (which is the abode of knowledge)! nallai nallai – (what you have done is) good, good. en seyyOm – what can I not accomplish? enna kuRaivinam – is there anything that is impossible for us? what deficiency we have? Oh heart! what you have done is good, good. When I have you, what can I not accomplish? After having your acceptance, is there anything impossible for us? Thus, even if we are being finished (due to separation from emperumAn), you keep engaging with him who is the eternally youthful enjoyer of srI mahAlakshmi who is most enjoyable. Being finished means AzhwAr suffering in separation due to considering himself lowly and shying away from emperumAn. 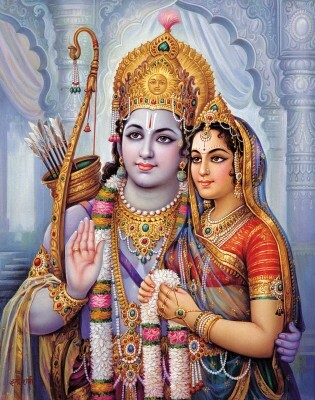 thunjum pOthum vidAthu thodar kaNdAy – Here two slOkams are quoted – srI rAmAyaNam ayOdhyA kANdam 31.5 “na cha sIthA thvayA hInA” (sIthA who is separated from you will not survive) and srI rAmAyaNam ayOdhyA kANdam 27.17 “yasthvayA saha …” (When I am with you it is heaven and when I am separated from you it is hell). nenjamE nallai nallai – Like parents will embrace their children who obediently completed a task, AzhwAr embraces his heart and glorifies it. nenjamE nallai nallai – Why is the repetition in appreciating his heart? Just like AzhwAr sends a messenger to bhagavAn, it appears to him that he also need to send a messenger to his own heart which already reached bhagavAn leaving AzhwAr behind as explained in thiruviruththam 30 “en nenjinAraik kaNdAl ennaich cholli avaridai nIr innam selleerO” (If you see my respectable heart, you ask on behalf of me why he has not reached bhagavAn with my message yet?). Since it is “mundhuRRa nenju” (the heart which headed towards him even before me), AzhwAr glorifies it repeatedly. unnaip peRRAl en seyyOm – When you are in sync with me and speak the same principles, what can I not accomplish? Iswaran is there to bless the result; you are there to not push it aside; thus, is there anything not possible to accomplish? ini enna kuRaivinam – In previous phrase, it looked like I mistakenly said that “I can accomplish anything” . But when bhagavAn is ready to unconditionally help us, what is that we can do? When him being the means eternally without any expectation, there is nothing for us to independently pursue. When asked “But, is there nothing we need to do?”, AzhwAr says “Yes, there is something for us to do” [Further explaining, that when emperumAn pursues us, we have to hold on to him instead of ignoring the great opportunity]. mainthanai – can any one leave this [eternally youthful] emperumAn?. mainthu – sweetness, beauty, gait. malarAL maNavALanai – I am telling you to never leave emperumAn who is inseparable by periya pirAttiyAr herself as she said in thiruvAimozhi 6.10.10 “agalagillEn iRaiyum” (I will never leave even for a moment). thunjum pOthum vidAthu thodar kaNdAy – Even if I say I am “unqualified” and try to leave, you have to hold on to him. vislEsham (separation) is explained as vinAsam (destruction). For him thunjuthal (getting destroyed) means separation as explained in srI rAmAyaNam ayOdhyA kANdam 31.5 “muhUrththamapi jIvAva:” (we will stay alive for only a moment after separating from you – said by srI lakshmaNa to srI rAma). AzhwAr says “even I say leave him, you don’t leave him”. He further says “You drink bhagavAn at least like drinking medicine” and “You enjoy emperumAn who pirAtti is saying ‘agalagillEn iRaiyum‘”. This entry was posted in thiruvAimozhi, thiruvAimozhi 1st centum on October 17, 2015 by Sarathy Thothathri.